Russian Emergencies Ministry members walk on a pier near the crash site of Russian military Tu-154 plane in the Black Sea in the Sochi suburb of Khosta, Russia, Dec. 25, 2016. Thousands of search and rescue workers from across Russia, including more than 100 Navy divers, converged on the Black Sea port of Sochi Sunday, searching for clues to the crash of a military plane that plunged into the sea with 92 people on board. A military spokesman said there were no survivors from the flight, which carried dozens of singers from the internationally acclaimed Alexandrov Ensemble, the official choir of the Russian armed forces. President Vladimir Putin declared Monday a nationwide day of mourning, as search teams prepared to work through the night to find evidence that could help determine why the TU-154 jetliner crashed two minutes after takeoff. "We will conduct a thorough investigation into the reasons and will do everything to support the victims' families," Putin said. 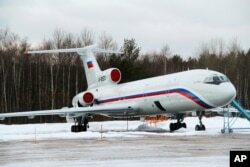 FILE - This photo shows the Tu-154 plane with registration number RA-85572 at a military airport near Moscow. This plane was taking the Alexandrov Ensemble to a concert at the Russian air base in Syria when it crashes just after takeoff from Sochi. Hours after the crash, officials said debris from the aircraft and some bodies had been recovered just off the Russian coast, with the main section of the plane found in 70 meters of water and 1.5 kilometers off the coast. Authorities said there was no immediate evidence of terrorism, while cautioning that criminal activity had not been ruled out. Russia's RIA Novosti news agency, quoting an unidentified source, said the plane likely crashed because of a technical malfunction or pilot error. The Soviet-era jetliner was carrying 84 passengers and eight crew, including 60 members of the famed choir who were set to perform for Russian military personnel at a Russian airbase near the Syrian coastal city of Latakia. Authorities said nine Russian reporters also were on board. Syrian President Bashar al-Assad expressed his condolences in a message sent to Putin Sunday, saying the crash would not affect his government's Russian-backed war against insurgents. "Our prayers are with you…our sorrows and joys are one," Assad told Putin. A condolence message on the Twitter feed of the U.S. Embassy in Moscow said, "Our thoughts and prayers are with the loved ones of the passengers and crew of the TU-154 which went down earlier today, and with the Russian people." Also on board was Yelizaveta Glinka, a well-known Russian physician known for her charity work. She was on her way to help deliver medical aid to Syria. 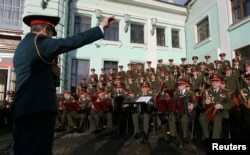 FILE - Singers and orchestra members of Red Army Choir, also known as the Alexandrov Ensemble, perform in Moscow, Apr. 20, 2016.